Scientists funded in part by the National Science Foundation (NSF) and affiliated from the University of Delaware and Amersham Biosciences, Inc., in Piscataway, New Jersey, have succeeded in conducting the first-ever DNA sequencing experiments at sea. Using the research vessel Atlantis and submersible Alvin, the team carried out a pioneering environmental genomic study of the strange life that inhabits super-hot hydrothermal vents almost two miles deep in the Pacific Ocean. "This research is important for its contributions to the new field of marine genomics and to our basic ecological understanding of unusual deep-sea vent communities," said Jim Yoder, director of NSF's ocean sciences division, which funded the research. "The partnership with industry and its direct participation in the expedition could lead to new drugs and pharmaceuticals." By the close of the 17-day research cruise, which ends today, the scientists estimate that they will have sequenced just under two million base pairs of DNA from different microbes and organisms that live in and around the vents. The amount of DNA sequenced during the trip will be equivalent to the size of a small bacterial genome, which typically ranges from two million to five million base pairs. 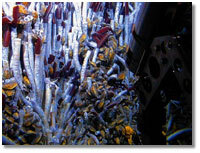 The microbes, tubeworms, and other vent dwellers are of critical interest to industry because these organisms may yield a range of new products and applications, from new pharmaceuticals to heat-stable, pressure-resistant enzymes for food processing, hazardous waste cleanup, and other fields. Under the direction of University of Delaware marine biologist Craig Cary, the team conducted daily dives aboard the submersible Alvin coupled with round-the-clock laboratory analysis on the R/V Atlantis. Two scientists from Amersham Biosciences' production sequencing group were on board using the company's MegaBACE 1000 DNA Analysis System and TempliPhi DNA Sequencing Template Amplification Kit. These technologies played a key role in carrying out the project in its natural environment, as soon as samples were collected by the sub and brought aboard ship. As part of a "virtual field trip," more than 13,000 students at 180 schools participated in the project, called "Extreme 2001: A Deep-Sea Odyssey." The students represented 32 U.S. states, Australia, Canada, Guam, New Zealand and Puerto Rico. Through phone call question-and-answer sessions to the ship, the educational program brought the excitement of real-time discovery into the classroom. The students and the public can log onto the expedition Web site at www.ocean.udel.edu/extreme2001 to see photos, video clips, and daily updates. "We are excited to be carrying out this new phase of the research, which takes the work we've done in previous years to the next level," said Cary. "It will allow us to better understand the amazing ecosystem that exists in these vents and how these organisms, which thrive under some of the harshest conditions on Earth, interact with each other." The research expedition took place in the Pacific Ocean some 1,200 miles off the coast of Costa Rica. The team studied the Pompeii worm (Alvinella pompejana), vent crabs, bacteria, and other life that inhabits deep-sea hydrothermal vents to find out how these organisms thrive in an environment that reaches temperatures of 750o Fahrenheit. "This work was not possible even a year ago. It really is due to MegaBACE and the use of TempliPhi that we are able to accomplish this," said Robert Feldman, production sequencing and collaborations manager at Amersham Biosciences. "The technology that we are successfully bringing to these deep-sea systems is creating the new field of marine genomics. These efforts will be seen as ground-breaking for future studies on environmental, ecological and evolutionary biology." Additional funding for the project came from the National Sea Grant College Program and the University of Delaware. If you look closely at the lower right-hand quadrant of this photo, you can see a Pompeii worm extending its dark-red feathery head and paler body from its tube home. The worm is about 4 inches long. A closeup of the worm is shown in the photo above. 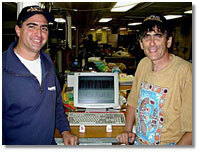 Robert Feldman (left), of Amersham Biosciences, and Craig Cary, University of Delaware marine biologist and chief scientist for the Extreme 2001 expedition, in the lab on board the R/V Atlantis. 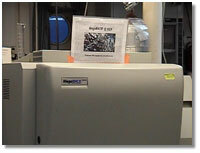 The MegaBACE 1000 DNA Analysis System and TempliPhi DNA Sequencing Template Amplification Kit have made it possible for scientists to analyze the DNA of deep-sea organisms in real time. Tubeworms have no mouth, eyes, or stomach ("gut"). Their survival depends on a symbiotic relationship with the billions of bacteria that live inside of them. 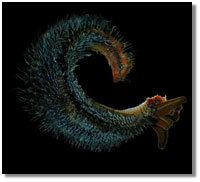 These bacteria convert the chemicals that shoot out of the hydrothermal vents into food for the worm. 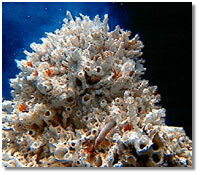 This chemical-based food-making process is referred to as chemosynthesis. Previous University of Delaware research confirmed that the Pompeii worm is the most heat-tolerant animal on Earth, able to survive an environment as hot as 176°F. Covering this deep-sea worm's back is a fleece of bacteria. These microbes may possess heat-stable enzymes useful in a variety of applications, such as pharmaceutical production, food processing, paper and textile manufacture, and others.